You may have seen our #IWD coverage where we introduced our "The Female Focus" blog series. As part of our #PressforProgress mission we want to raise visibility of some of the incredible Female Founders changing the game in the world of business today. So, first off the starting block let's introduce the two female founders of The Basket Room Holly and Camilla. Tell us a bit about The Basket Room, how you got started, what you do and where did the idea first come from? HOLLY: The Basket Room is an ethical homeware company specialising in baskets! 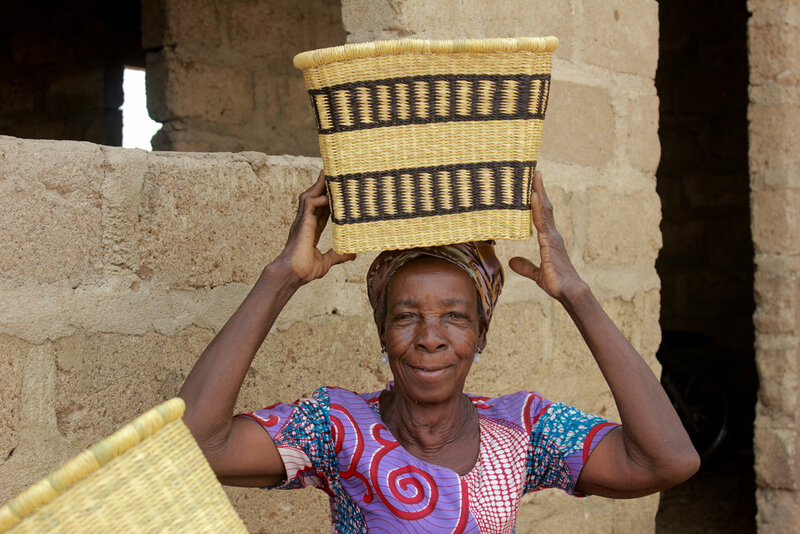 We work with weaving cooperatives in Africa (Kenya, Ghana, Rwanda, Tanzania and Swaziland) to produce beautiful, fair trade baskets for the home. Our current range spans from baby Moses baskets and bike baskets to mats and floor runners, planters, laundry baskets… and everything in between! Camilla and I studied fashion together at university and then went on to work in different areas of fashion and retail when we graduated. It was when I was a buyer and business development manager for an African charity and Camilla was working in fashion production that we both began to dream of running our own business – and we’ve always had a mutual interest in ethical fashion and handicrafts. How did you end up starting this venture together? CAMILLA: In 2013, I invited Holly to come up to London for a talk about corporate social responsibility, and this kick-started a whole bunch of conversations about our own business ideas. After this, we kept in touch more regularly, bouncing business ideas off one another before ultimately deciding over a Skype chat (me in Tanzania and Holly in Oxford) that we would join forces and become business partners. Six months later, we launched The Basket Room. What advice do you have for budding female entrepreneurs looking to take the plunge? HOLLY: Believe in yourself and draw strength from those around you. Plan, collaborate and absorb as much help and advice as you can from friends, or people doing similar or complementary things to you, business-wise. What is the biggest challenge you currently face or have faced since you set up? CAMILLA: Managing quick growth! It has all happened in a flash and so processes and systems have needed implementing from scratch, and also updating - all very rapidly. Likewise, we have had to employ more staff and respond to an ever increasing demand for baskets… All very positive challenges, of course, but they’re challenges all the same! HOLLY: We work really hard to seek out the very best, most talented weaving groups to partner with, and often we first hear of them by word of mouth. Each cooperative is run as a business, so our first point of contact is usually the chairlady who manages the basket orders and each weaver’s workload, and negotiates prices per unit with us, on behalf of the group. From that point forwards we would send over specific designs and any special materials needed to produce the new order, and then we keep in touch via WhatsApp as prototypes are made up and photographed for us to check over. Camilla and I try to visit every group as often as possible. As well as for practical reasons (like delivering materials and training) it’s vitally important to us to spend time with the people behind the baskets and really understand each basket’s beginnings. What does this additional work/income mean to women in these communities? CAMILLA: It’s often the difference between being able to pay school and hospital fees, and not. The vast majority of the weavers are women whose primary roles are as mothers and as farmers. But when crops fail and livestock suffer in the dry seasons, basket weaving offers a sustainable supplementary income that doesn’t get in the way of other commitments and responsibilities. In fact, basket weaving is a very sociable and portable craft: our baskets get taken to all manner of social events before being finished and sent to us. These talented, multitasking women do their weaving here and there, as and when time allows, throughout the day and the week. What are they able to achieve with the independence of more financial freedom? HOLLY: Some use their earnings to buy land or livestock so they can invest more in their own agricultural businesses. Others have talked about enjoying the sense of autonomy that comes from not having to go to their husbands to ask for money to purchase things for the home, for the children, or for themselves. Profits made by the cooperatives – after wages have been paid – are reinvested for the community. Groups have chosen to use their profits from basket sales to purchase land for communal use and to pay for lighting so that weaving can go on after dark. Some groups can also take out interest-free loans using profits from basket sales, which can be paid back out of future basket income. Do you have a particular story of one of your weavers that has particularly touched or inspired you? DORCAS: A lot of things bring me happiness. If my family has good health, I am happy and thankful. If the rains are in plenty, I am happy because I know that the harvest won’t fail. When I am leading a project and it is flourishing and the lives of the members are positively impacted, I am happy. Weaving, as well, makes me happy, especially when I look back and see how much my family and I relied on the income from the sales of baskets that I wove, when the rains failed and I had no produce to sell at my green grocery. PENINAH: Before I joined our weaving cooperative a few years ago, I used to rely on my husband for everything we needed at home. Back then, I felt I couldn’t even ask him for money for a new pair of shoes because there were just too many more important things for the home that we needed first. But when I started weaving with our cooperative, I had the means to not only help support the family, but also to surprise my husband with new things for him, like a new hat or a pair of trousers. FLORENCE: I never travelled much before, but since we started selling the baskets in Nairobi, I’ve realised how much I enjoy travelling. I am now able to travel all over Kenya with my work, and sometimes I take my family with me. I also don’t have to rely solely on my husband’s income in running my household anymore. What is your hope for The Basket Room? What's the master plan? HOLLY: Despite mentioning the need to plan ahead, the business does appear to have a mind of its own! We like to explore the natural path it seems to be taking, though we sometimes have to adjust its direction a little. Looking forward, we hope that The Basket Room will become a household name that resonates with people in years to come; a social enterprise that will partner with artisans all over the world, changing and leading the way for the homewares industry. The fashion world is currently under increasing pressure to operate more ethically, and I think that the world of interiors has yet to catch up on this. We’d like to keep pushing from the front on this matter, flying the flag for transparent supply chains and fair trade in interiors. GDPR…. What the **** is it all about?